How can Russia use gold? The data published by the World Gold Council on February the 12th suggests that Russia's gold reserves have grown significantly in 2014. In his interview with “Russia Today” Mark O'Byrne has tried to comment on Russia's strategy. He is sure that Central Bank of Russia is increasing its gold reserves to lessen the U.S. dollar's role in the world. GoldCore's executive director claims that now the Central Bank of Russia possesses large amounts of American currency. 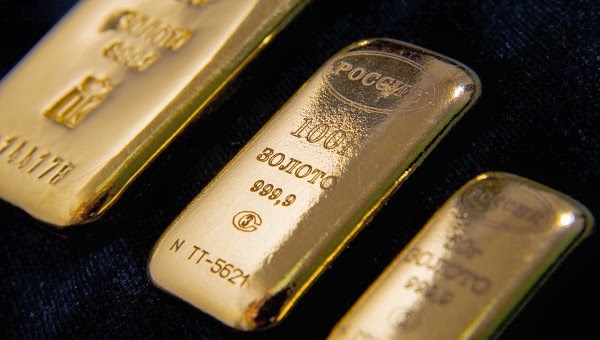 Mister O'Byrne stated that the Central Bank of Russia will stop buying gold and start selling it only if faced with severe economic difficulties. Russia uses the precious metal to ensure ruble's stability and is counting on increasing of gold prices. In the international market Russia's role as a credit provider shall remain unchanged and that's why the Central Bank requires significant gold reserves. Gold also plays a vital role in ensuring ruble's stability. The director of GoldCore said that in the future ruble may become the world's reserve currency. Follow the news, share this information in your social networks, and be the first to find out about the situation in the world markets and how the gold prices change!